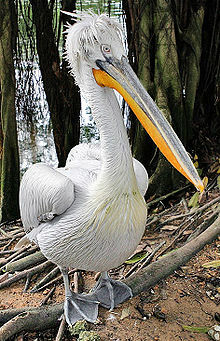 The Dalmatian pelican (Pelecanus crispus) is a large bird. It lives in wet places such as in swamps and shallow lakes. It can be found from southeastern Europe to Pakistan and China. It is the largest member of the pelican family. The average length is 170–190 cm (67-75 inches) The average weight is 11–15 kg (24-33 lbs). The wings are around 3 m (10 ft) across. It is the world's heaviest flying bird on average. However, sometimes a few birds from another species may also be as large or larger. ↑ John B. Dunning Jr. (ed) 1992. CRC handbook of avian body masses. CRC Press. ISBN 978-0849342585. This page was last changed on 3 January 2019, at 06:42.